Ehud Olmert (born September 30, 1945) is an Israeli politician and lawyer. 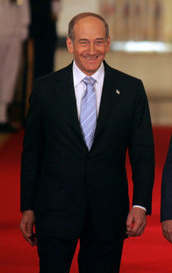 He served as Prime Minister of Israel from 2006 to 2009 and before that as a cabinet minister from 1988 to 1992 and from 2003 to 2006. Between his first and second stints as a cabinet member, he served as mayor of Jerusalem from 1993 to 2003. The day will come when the two-state solution collapses and we face a South African-style struggle for equal voting rights. As soon as that happens, the state of Israel is finished. The Jewish organizations, which were our power base in America, will be the first to come out against us, because they will say they cannot support a state that does not support democracy and equal voting rights for all its residents. When we saw that the Secretary of State, for reasons we did not really understand, wanted to vote in favor of the U.N. resolution... I looked for President Bush and they told me he was in Philadelphia making a speech, I said, 'I don't care. I have to talk to him now'. They got him off the podium, brought him to another room and I spoke to him. I told him, 'You can't vote in favor of this resolution.' He said, 'Listen, I don't know about it, I didn't see it, I'm not familiar with the phrasing.' [I said to him] 'I'm familiar with it. You can't vote in favor.' He gave an order to the Secretary of State and she did not vote in favor of it -- a resolution she cooked up, phrased, organized and maneuvered for. She was left pretty shamed and abstained on a resolution she arranged. This page was last edited on 25 March 2017, at 16:51.